Vitamin D requires chemical conversion in the liver, kidney and other tissues to form 1,25 dihydroxyvitamin D, the physiologically active form of vitamin D.
The age-dependent decrease in 1 alpha-hydroxylase and concomitant increase in 24-hydroxylase activities observed in mitochondria isolated from kidneys of 2-, 6-, 12-, 18-, and 24-month-old rats could not be attributed to changes in the bioenergetic properties, i.e. the respiratory chain (???? ), of the mitochondria. When vitamin D-sufficient rats having suppressed renal 25-hydroxyvitamin D3 1-hydroxylase activity are placed on a low-calcium vitamin D-deficient diet for 7 days, the 1-hydroxylase activity is greatly stimulated in 6-wk-old rats but much less so in rats with advancing age. Phosphatidylethanolamine and cardiolipin both brought about a dose-dependent decrease in the 1-hydroxylase activity in mitochondria from vitamin D-deficient chicks but not from vitamin D-replete chicks. Vitamin D uptake into the cell depends on cubilin and megalin mediated endocytosis. Proximal tubule endocytic apparatus as the specific renal uptake mechanism for vitamin D-binding protein/25-(OH)D3 complex. Albumin binds to Vitamin D and, therefore, reductions in albumin will be accompanied by parallel reductions in the latter. Vitamin D responsive elements (VDREs) consisting of direct hexanucleotide repeats with a spacer of three nucleotides have been identified in the promoter regions of positively controlled genes expressed in bone, such as osteocalcin, osteopontin, beta 3-integrin and vitamin D 24-OHase. Taken together, both screening approaches suggest that a reasonable proportion of all VDR target genes, if not all, are under the control of multiple VDREs. The hormonally-active form of vitamin D, 1,25-dihydroxyvitamin D, has been shown to play critical roles in the human body and regulates over 900 gene variants. There are thousands of these binding sites regulating hundreds of genes in a cell-specific fashion. The 1,25(OH)2D3 ligand promotes VDR-RXR heterodimerization and specific, high affinity VDRE binding on their promoter, whereas the ligand for RXR, 9-cis retinoic acid (9-cis RA), is capable of suppressing 1,25(OH)2D3-stimulated transcription by diverting RXR to form homodimers. Major Target genes are: osteocalcin, osteopontin, beta 3-integrin, renin and vitamin D 24-OHase. The vitamin D hormone and its nuclear receptor: molecular actions and disease states. Upregulation of vitamin D binding protein (Gc-globulin) binding sites during neutrophil activation from a latent reservoir in azurophil granules. Cyclin D3 interacts with vitamin D receptor and regulates its transcription activity. Cyclin D3 promotes adipogenesis through activation of peroxisome proliferator-activated receptor gamma. Vitamin D receptor is not required for the rapid actions of 1,25-dihydroxyvitamin D3 to increase intracellular calcium and activate protein kinase C in mouse osteoblasts. 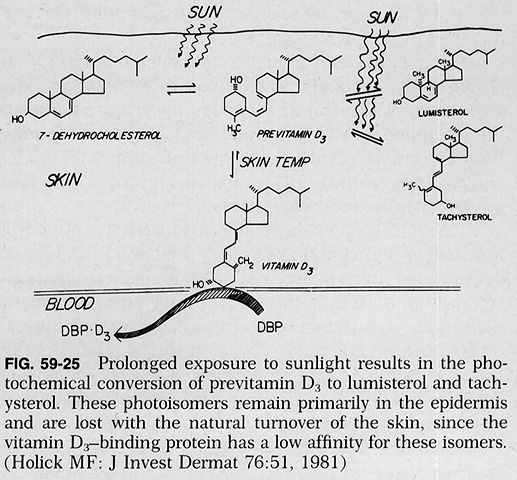 Hydroxylase enzymes of the vitamin D pathway: expression, function, and regulation. 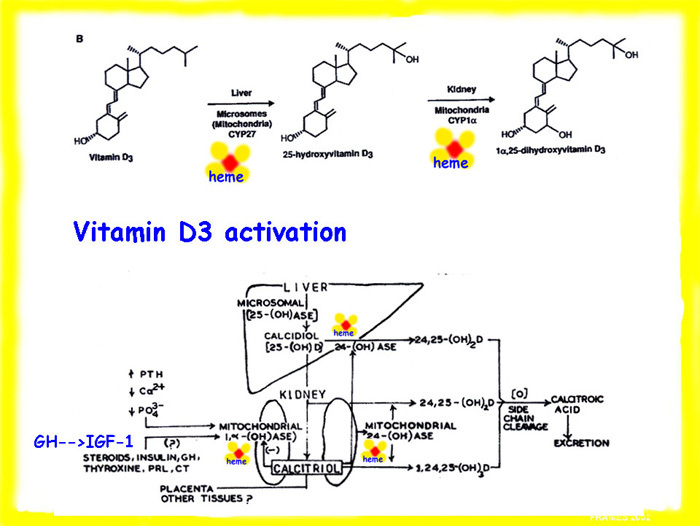 Activation of Src kinase in skeletal muscle cells by 1, 1,25-(OH)-vitamin D(3) correlates with tyrosine phosphorylation of the vitamin D receptor (VDR) and VDR-Src interaction. Open question: VDR nuclear translocation requires dephosphorylation that can be inhibited by cyclosporine ? Calcium metabolism in adolescents and young adults with type 1 diabetes mellitus without and with persistent microalbuminuria. Alterations in serum levels of 1 alpha,25(OH)2 D3 and osteocalcin in patients with early diabetic nephropathy. Involvement of the vitamin D receptor in the regulation of NF-kappaB activity in fibroblasts. Vitamin D regulates the phenotype of human breast cancer cells. Increased NF-kappaB activity in fibroblasts lacking the vitamin D receptor. Secondary hyperparathyroidism promotes the acute phase response -- a rationale for supplemental vitamin D in prevention of vascular events in the elderly. Vitamin D status affects serum parathyroid hormone concentrations during winter in female adolescents: associations with forearm bone mineral density. Effects of different dress styles on vitamin D levels in healthy young Jordanian women. Tryptophan missense mutation in the ligand-binding domain of the vitamin D receptor causes severe resistance to 1,25-dihydroxyvitamin D.
When exposed to senescent signals, cellular SIRT1 and FoxO are downregulated, which results in downregulation of the antioxidant MnSOD. Szeto FL, Sun J, Kong J, Duan Y, Liao A, Madara JL, Li YC. Committee on Molecular Metabolism and Nutrition, Biological Science Division, The University of Chicago, Chicago, IL 60637, USA. We have used mouse embryonic fibroblasts (MEFs) derived from VDR and VDR mice to determine whether the nuclear vitamin D receptor (VDR) is directly involved in the regulation of NF-kappaB activation. We found that the basal IkappaBalpha protein level was markedly decreased in VDR MEFs compared to VDR MEFs; however, degradation of IkappaBalpha and its phosphorylation were not altered in VDR cells, neither were the levels of IKKalpha and IKKbeta proteins. Consistently, p65 nuclear translocation was increased in unstimulated VDR cells. The physical interaction between VDR and p65 was absent in VDR MEFs, which may free p65 and increase its activity. Consequently, these alterations combined led to a marked increase in NF-kappaB transcriptional activity. Consistently, induction of IL-6 by TNFalpha or IL-1beta was much more robust in VDR than in VDR cells, indicating that VDR cells are more susceptible to inflammatory stimulation. Therefore, fibroblasts lacking VDR appear to be more pro-inflammatory due to the intrinsic high NF-kappaB activity. The reduction of IkappaBalpha in VDR MEFs may be partially explained by the lack of VDR-mediated stabilization of IkappaBalpha by 1,25(OH)(2)D(3). These data suggest that VDR plays an inhibitory role in the regulation of NF-kappaB activation. 1alpha,25-dihydroxyvitamin D3 inhibits anti-CD40 plus IL-4-mediated IgE production in vitro. Kaposi sarcoma is a therapeutic target for vitamin D(3) receptor agonist. Regulation of IL-1 family cytokines IL-1alpha, IL-1 receptor antagonist, and IL-18 by 1,25-dihydroxyvitamin D3 in primary keratinocytes. Transcriptional repression of the interleukin-2 gene by vitamin D3: direct inhibition of NFATp/AP-1 complex formation by a nuclear hormone receptor. 1 alpha,25-Dihydroxyvitamin D3 inhibits gamma-interferon synthesis by normal human peripheral blood lymphocytes. Una review in italiano abbastanza completa su Le Scienze Dicembdre 2007, pag 96. Vitamin D, Pit-1, GH, and PRL: possible roles in breast cancer development. The calicalciferol is a steroid which comes from the idrocolesterol after the sunlight exposure. It is the precursor of the biological active form of the vitamin D, known as calcitriol. This steroid goes to the liver and then to the kidney, where it is turned into in 1.25 didrossicolecalciferol which is functionally active. The active form of the vitamin can act on different tissues regulating the calcium phosphorus metabolism increasing the renal reabsorption and the intestinal absorption of these elements. As other different hormones, the ability of this vitamin steroid nature to regulate the gene expression has urged a lot of researchers to develop the biological and pharmacodynamic characteristics of these elements. These investigations have revealed new therapeutical properties comparable with some growing factors. Herewith I’m reporting some pathologies where the vitamin administration has shown some beneficial effects. Recent studies have revealed that women who ingest more than 400 IU of vitamin D day reduce their risk of developing rheumatoid arthritis by as much as 42%. Vitamin D deficiency has been associated with an increased risk of developing oreoarthritis. Studies in mice have suggested that preatreating mice that are prone to developing type I diabetes with the active form of vitamin D reduces the development of type I diabetes by 80%. This study is supported by the observation in Finland where children in the 1960’s routinely received 2,00 IU of vitamin D a day during their first year of life. When these children were followed for the next 31 years, it was observed that these children had a reduced risk of developing type I diabetes by 78%. Children who were vitamin D deficient at the same time and also followed for 31 years had an almost 300% increased risk of developing type I diabetes. The beta islet cells that produce insulin in the pancreas have a vitamin D receptor. The active form of vitamin D stimulates the pancreas to produce insulin. It has been observed that the relative risk of developing type II diabetes is reduced by as much as 33% in men and women who increase their intake of vitamin D above 800 IU/day along with 1,000 milligrams of calcium. Vitamin D deficiency will cause removal of both the calcium and matrix from the bone, and as a result, will cause osteopenia and can precipitate and exacerbate osteoporosis. Unlike osteomalacia which causes bone pain, osteoporosis, which is porotic bone holes in the bones and loss of bone doesn’t cause bone pain unless there is an acute fracture. Typically this pain resolves as the fracture heals and can be easily distinguished from osteomalacia. Other cases where the vitamins administration seems to get good results are: the epilepsy, schizophrenia, depression, cancer and obesity. va bene discutiamone pure, ma mi sembra che voi andiate d'accordo con gli studenti del San Luigi. e potreste non cambiare nulla. e io non intendo cambiare il mio modo di procedere, anche se a loro risulta incomprensibile. To investigate vitamin D-related control of brain-expressed genes, candidate vitamin D responsive elements (VDREs) at -7/-10 kb in human tryptophan hydroxylase (TPH)2 were probed. These genes possess vitamin D responsive elements (VDREs) in their promoters. Plasma levels of triglycerides were inversely associated with tertiles of plasma 25OHD levels and changes in plasma triglycerides levels correlated inversely with seasonal changes in vitamin D status. Intracellular localization and translocation of 1 alpha, 25-dihydroxyvitamin D3 receptor in osteoblasts.